Offer ends: Apr 19 '19 at 7:30 pm ET Ordering will be unavailable site-wide from Friday 7:30 PM EDT to Sunday 9:00 PM EDT. Please order before Friday 7:30 PM EDT to be eligible for this rebate. 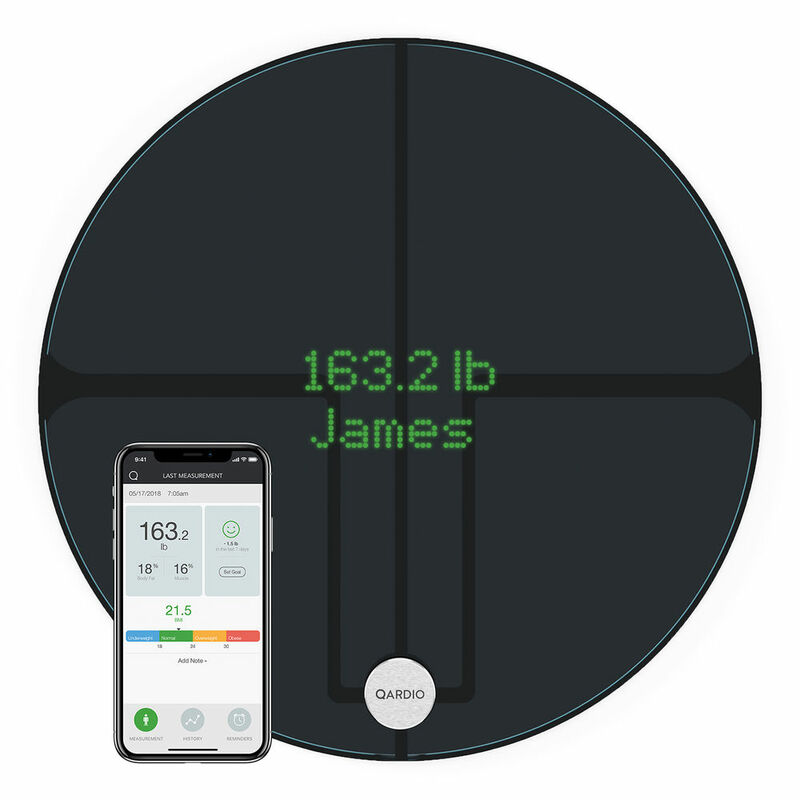 Monitor more than just your weight with the QardioBase 2 Wireless Smart Scale from Quardio. The QardioBase 2 is designed to measure your weight, BMI, and body fat percentage, as well as your muscle, bone, and water composition. All of this data can be synched up with the Qardio app for iOS, Android, and Kindle devices via Bluetooth or Wi-Fi technology. The scale can recognize multiple users, so the whole family can keep track of their health status and/or weight loss progress. Stand on the scale and your name and weight are displayed on its surface. Weight can be displayed in pounds, kilograms, or stones, or you can use the Smart Feedback system to get rid of stressful numbers for a more motivational set of smileys. With helpful modes, convenient smart features, and a sleek design, the QardioBase 2 can help you and your family maintain a healthier lifestyle. For moms-to-be, the QardioBase 2 has a special pregnancy mode that lets you track weekly progress and add pictures to your numbers. For those with pacemakers, a Weight Only mode turns off the additional tracking features that could possibly cause interference with the device. The QardioBase 2 features tempered glass construction with an ABS plastic bottom housing. It's 13.4" in diameter, so it can accommodate kids and most adults. The LED display built into the top of the scale displays your name, weight or smart feedback smileys, and body fat percentage. The built-in battery can be recharged with the included USB to Micro-USB cable, but on a full charge, it is designed to last for up to 12 months of frequent use. A gentle vibration lets you know when the QardioBase 2 has finished taking your measurements. An ideal feature for those with visual impairment. The scale can measure weights from 9 to 396 lb, and is engineered to be accurate to within 0.2 lb. The QardioBase 2 supports the Qardio app for iOS, Android, and Kindle devices, but it's also compatible with MyFitnessPal, Samsung Health, Apple Health, Google Fit, Apple Watch, and Wear OS. Box Dimensions (LxWxH) 14.7 x 14.5 x 1.4"